by Molly Jane Kremer, Clyde Hall, Mickey Rivera, Sara Mitchell and Jarrod Jones. Comics that challenge us, slay us, beguile us — the comics we simply can’t wait to devour. That’s DoomRocket’s Staff Picks. From ‘Daredevil’ #1 to the latest thrilling issue of ‘Die’, here are the comics that have our hearts set ablaze this week. Letters by VC’s Clayton Cowles. MJ: Chip Zdarsky’s writing career at Marvel has been a delight to follow. The series he’s already penned have been typified by their critical acclaim, astoundingly excellent art teams, oft unexpected emotional impact. (Who would have thought an issue of Howard the Duck could make you cry?) 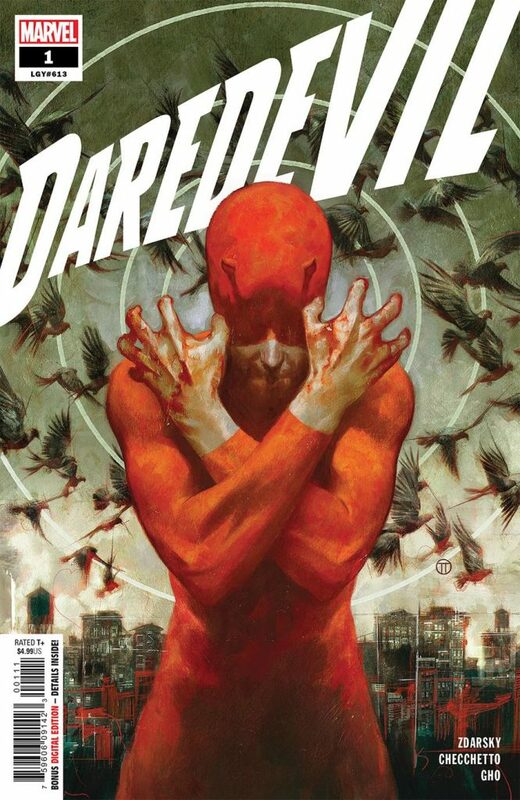 Zdarsky’s latest Marvel outing, this time with Marco Checchetto, Sunny Gho and Clayton Cowles, is Daredevil, which seems like both a surprising choice for the writer while also being an obvious and fitting next step. Though Chip is new to the title, Checchetto has some experience drawing Mr. Murdock (from almost ten years ago, during the “Shadowland” storyline). He’s comfortable drawing the character, and it shows in his pages. We get a Daredevil instantly recognizable to viewers of the Netflix series, with the additional jolt of incisive empathy Zdarsky always packs into his scripts. Combined with Checchetto’s fluid storytelling and knack for eloquent expressiveness, Daredevil #1 sneaks up on you only to poke you in the ventricles, just so. With such a talented, already-perfectly-gelled creative team, I hope this series doesn’t fall prey to the one complaint I foster for Zdarsky’s various Marvel series: they always, always end sooner than I want them to. But to be left wanting more is by far not the worst way for a series to affect you; it actually might be the best way. Still, I’m still crossing my fingers for a good long run by this excellent crew, because this Daredevil #1 feels like the kickoff of a monumental run, whether we get fifteen more issues or fifty. SM: Die has come to tell us that the past is a barbed hook. One that’s sunk into your back and can pull you along wherever it likes. You’re unlikely to remove it without pain and damage, and you’re definitely not removing it without a little help. We follow five old friends who, in a Jumanji-like fashion, were sucked into a game called Die as teenagers, and now must return as adults to retrieve the friend they left behind. Die is saturated with references to other games, artists and stories. It exists as a medium to express writer Kieron Gillen’s joy of gaming. And the joy shows. 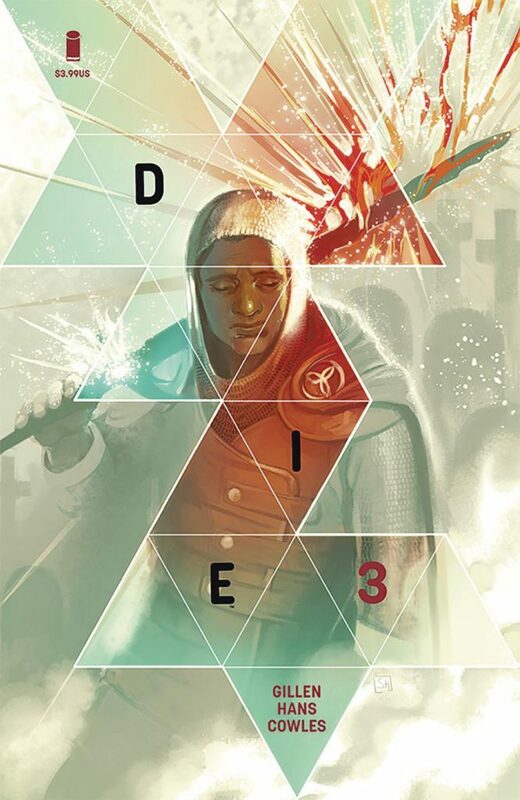 Die is a bag of tricks for anyone who’s taken a dive head-first into fantasy with the pure intentions of a curious imagination, even if things end up going terribly wrong. After a few unnerving reminders of the past relationships left in the wake of their two-year entrapment within the game, I think where the adventure lies in the issues to come is not in the grand scope of the world they will travel (painted beautifully by Stephanie Hans, I might add), but in the relationships. More interesting than the game or the concept of Die is the way in which these people are connected to each other. Like hooks gently pulling them closer. Written by Lonnie Nadler and Zack Thompson. 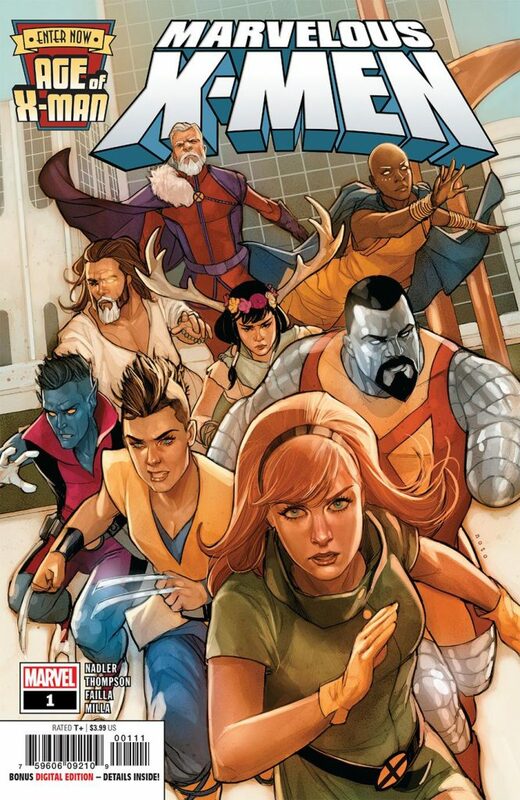 MR: Having already kicked things off last week with the inaugural Alpha issue, Lonnie Nadler and Zac Thompson now take on Age of X-Man: Marvelous X-Men. The Age of X-Man event is a thought experiment teeming with potential: The struggle between humans and mutants is over and the mutants have won. Homo Superior has created a high-minded utopia in place of the old order, but it’s a paradise built on the strict regulation of personal relationships. Nadler and Thompson, a couple of my favorite comic scribes in the past year, have written about tough-love social policies before in The Dregs. They’ve written about well-meaning psychopaths in Come Into Me. Perhaps most importantly for Marvelous X-Men, they’ve got a deep love for mutant mythology that showed itself in their Cable run. They’ll be joined in this book by the kinetic cartooning of Marco Failla, letters by Joe Caramagna, and colors by the estimable Matt Milla. With talent like that, this will definitely be worth checking out. Written by Peter J. Tomasi. Art by Carlo Barberi and Matt Santorelli. CH: Kon-El’s returned while Jon Kent’s now seventeen and scarred thanks to his loopy grandpa. The 12-issue maxi-series Adventures of the Super Sons may be our last chance to see the Robin/Superboy Team in Stand by Me mode as they have a summer-before-things-went-wonky bromance escapade. My plan is to savor every issue, including #7 when it hits shops this week. Not that Brian Michael Bendis doesn’t have great plans for Jon. He should certainly qualify for the Teen Titans now, if nothing else. It’s just that Peter J. Tomasi’s Superboy and Jon’s relationship with his family, not to mention with Damian Wayne, have given me many hours of reading pleasure. I’ll hate to see that dynamic end. Still, the Adventures storyline is a fittingly epic swan song. So far, we’ve seen a Junior Injustice Gang that includes Shaggy Boy, Ice Princess, Brainiac 6, Joker Jr., Kid Deadshot, and Rex Luthor. The brief return of the Puppeteer. Superboy Red/Superboy Blue. Space Cabbie. Tommy Tomorrow. Lobo. A Planet of Mystery and Secrets with alien hosts Kainn and Labell. Hukka from Atari Force. 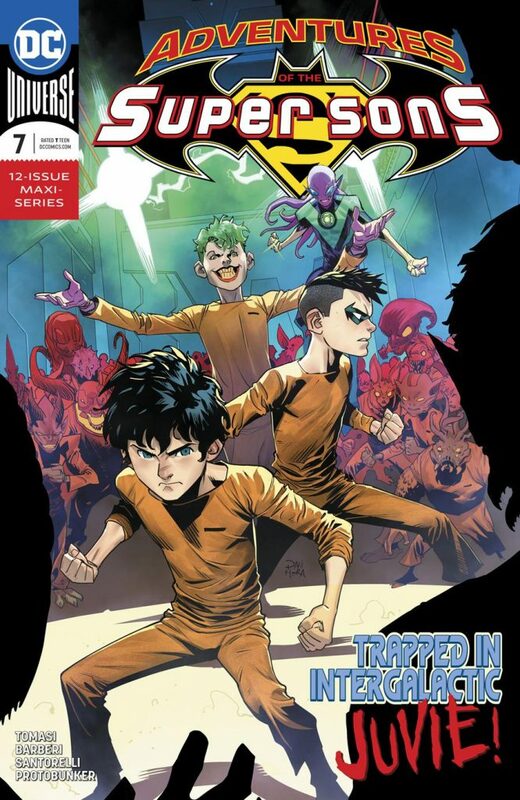 In the forthcoming issue, Jon and Damian find themselves placed in an Intergalactic Juvenile Detention facility. Basically, this title’s a field day if you enjoy cheesy DC fun. While I appreciate grande cuisine comics, the sorts that win lofty funny book awards, a part of me will always crave the occasional comic book equivalent splurge of a pepperoni, mushroom, hamburger, Philly steak pie with extra cheese. Tomasi’s a pizza buffet chef when it comes to Adventures of the Super Sons. Celebrate every slice. JJ: Ah, Giant Days. The comic book equivalent to a snuggle in the warmest, coziest comforter you’ve ever squeezed. It’s a piping-hot mug of cocoa with those dang little marshmallows bobbing around on top. It’s the book I read when I need a reprieve, when I want to relax. When I read Giant Days, for those fleeting moments, anyway, I know peace. You can, too. Tell me you’re reading this. Yes? Great. Now I want to address those in the world who aren’t. Forty-seven issues may seem like jumping in at the deep end of the narrative pool, but Giant Days isn’t here to intimidate. Heavens, no. Giant Days is a collection of snapshots, moments, adventures, misadventures. Set during a time when life is still ahead, so there’s plenty of time to just, y’know, figure stuff out. Have a disaster of a relationship. Maybe keep smoking for a bit. And if it’s your third year of college and you haven’t learned how to drive yet, well, there’s time for that, too. Even if you are a “two-ton metal death-bringer”. 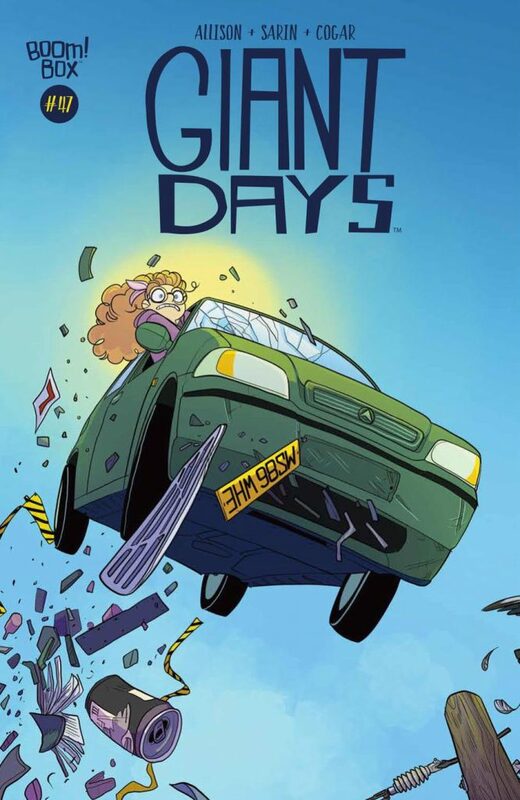 Look, the only thing I can guarantee is that if you jump into Giant Days with its forty-seventh issue, you will most certainly be hitting up your nearest LCS for the preceding forty-six. There’s just no way to prepare you for all the poignant heartache, genuine belly-laughs, and absolute genius on display in this, one of the finest comic books I’ve ever read.